Are you going to stun everybody at the party with your looks? Then orange eye makeup is what you should choose. This makeup is eye-catching and makes you look breathtaking at any event. So, try this makeup and see how you turn heads towards you! You can combine your favourite hues with orange and make your own style. Orange eye makeup not only attracts the attention of people around you, but this look also happens to remain in the minds of people for a long time. So, they will remember you for a long time. 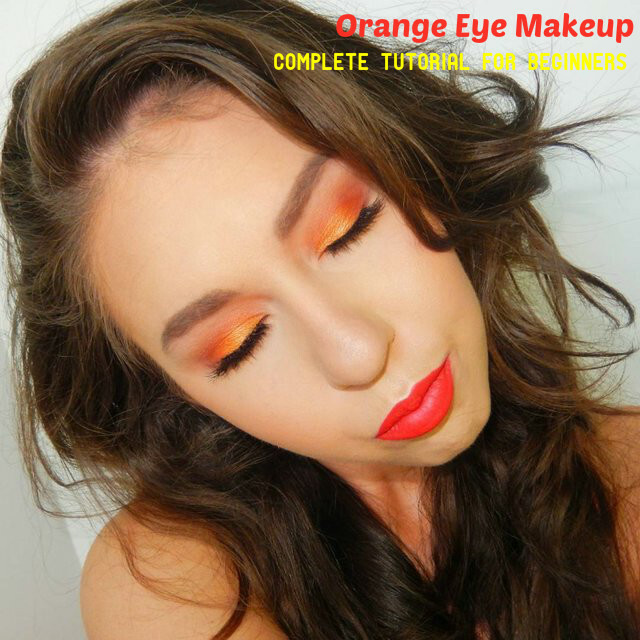 You can try orange makeup and look fabulous whether you are going for a date or a party. Before you start your eye makeup, cleanse your face well and prepare yourself for the makeup. Take a brush and apply a layer of foundation on your face. Blend it well on your skin, so that your skin looks even and smooth. Next you have to take a concealer and cover acne, spots, other marks and blemishes on your skin. Now make your face ready by using a facial makeup powder. Matte effect is the best. You get various coloured powders in the market. You can choose a colour that suits your skin tone. To start with the eye makeup, you have to first apply primer all around the eye lid. Once you have applied the primer, you can start applying orange eye shadow in circular motion. Make sure that you apply the shadow towards the inner corner of the lid, if you are mixing it with any other colour. Blend it well and then use a warm colour. Brown is a good colour to mix with orange colour. Blend it with the orange coloured eye shadow. Apply the brown eye shadow towards the outer end of the lids. You can also use other colours like rust, gold, as well as other warm tones of the orange family. You may give your eye shadow a smoky effect also. For this you have to apply black eye shadow or any other warm colour that you have applied with the orange eye shadow. Blend the black colour with the crease of the eye. You can use your fingers for blending it. You may also use a sponge instead of using your fingers. Now you have to use the same colour on your lower lids also. Start with orange and then apply brown and finally the black eye shadow. If you want to make your eyes look bigger, you can apply a highlighting eye shadow just under your eyebrows. This will open up your eyes and make your eyes look bigger. Next you can apply the eye liner. Use black eyeliner to give more depth to your eyes. Take a pencil liner and line your lids and the waterline. After lining your eyes with the eyeliner, you can apply the mascara. This will complete your look. You can use black mascara on your lashes. This will give a dramatic finish to your eye makeup. If you want to make your eyes look even more beautiful, you can fix artificial eyelashes. Now all that you need is to create a perfect pout by applying a subtle lipstick on your lips. You can choose a soft lipstick tone with a satin finish. Take care not to use too bright lipsticks hues when you do orange eye makeup, because your eye makeup is already well defined. Instead of using the lipstick, you can also dab some lip gloss. Now you are ready to rock the party! Here are certain orange tones that would suit different skin tones. Check them out and see what would suit your skin tone. If your skin tone is dark, tangerine orange is the right shade of orange eye shadow for you. You have to apply it in the correct style to make it stand out. Apply it in layers. The first step is sheer application of the eye shadow, starting from the lids and going towards the crease. In the final step, you can apply a little bronze or gold. This will give a beautiful classy effect to your eyes. You may think that if your skin is fair, orange eye makeup can make your skin look weird and ghostly. But this is not true. All you have to do is to choose a hue of orange that will look great on your skin tone. You can use creamsicle shade of orange if your skin is fair, especially when you have blue eyes. This will surely make you look stunning. Women with olive skin tone look great with orange eye makeup. They can carry it off better. You can use coral orange hue if you have olive skin tone. This will look best on your skin. To get better results, you can use matte finish. You can also mix orange and pink from lighter to darker tones and create a superb look. Orange is a classy colour and makes you look amazing. Many are of the opinion that orange does not suit all skin tones. But if you love colour, you should surely wear this colour and it will make you look attractive. So, try on this classy orange makeup and see how it changes the way you look.